With the aim of creating a clear picture of a fun trampoline, we are putting forward a detailed review of the ExacMe 6W Legs Trampoline. First, we’ll start with the general specs and then a few details about its features. The review will include some pros and cons, plus the conclusions other ExacMe trampoline owners reached while putting this bouncy land to the test. 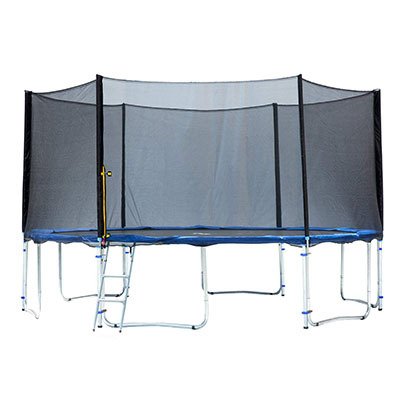 First of all, the ExacMe 6W Legs Trampoline has an extremely strong frame. For that extra layer of support we all want, the body presents an extra level of protection. This way, your trampoline is going to withstand the elements. On top of that, the galvanized steel frame is rust-resistant. As a result, you’ll get years of use out of your trampoline, even if you leave it outside year-round. The reason the structure is so sturdy is because it has 6 U-shaped legs that are supported at balanced contact points. This adds to stability. When properly assembled, the ExacMe 6W Legs Trampoline will not wobble or tip. Once you have a sturdy frame under a trampoline, you still need to secure the jumping platform safely. ExacMe takes care of that aspect as well. The trampoline reinforces stability through a special series of straps and ropes, each lined up with the 12 contact points on the 6 legs. Making certain the trampoline platform aligns with the support legs reduces any tendency for the trampoline to move during use. The ExacMe 6W Legs Trampoline is available in three different series models. There is the T, C, and S-Series, each offering different sizes between 8 and 16 feet in trampoline diameter. No matter how much space you have, or how many kids will regularly use your trampoline, there is a size to fit your needs. The frame is extremely sturdy and durable. It is made of rust-resistant, galvanized steel. This strong frame is what gives the ExacMe 6W Legs Trampoline the highest weight capacity rating for comparable trampolines, namely 398 pounds. There is a heavy-duty zipper to close up the opening. On the outside of the zipper is a security tie to make sure the flap doesn’t open by accident. With multiple models and sizes, there is a perfect trampoline for any unique situation. The ExacMe 6W Legs Trampoline will be delivered in three boxes. However, packages may not arrive all on the same day. Two of these boxes are also very heavy. The price is a little higher than comparably sized trampolines. Nonetheless, the quality shows off the moment you have your trampoline assembled. Assembling the ExacMe 6W Legs Trampoline takes, on average, about two hours. It is fairly simple and requires no tools. Here are the simple steps for assembling your trampoline. Inspect the trampoline area – Make certain the area under and immediately adjacent to where you’re going to assemble the trampoline is level and free of potentially dangerous items. Stay away from power lines. Some owners choose to cover the area under their trampoline to avoid mowing or weeding. Check all the parts – Lay out all the poles, support brackets, and springs to make sure delivery packages contain everything. Inspect the trampoline surface for tears or damaged spots. Lay out the enclosure out flat, inspecting it for problems as well. Layout the frame and support legs – Lay each of the support rings down first forming a circle. Match up one W-shaped support leg at each junction point. Attach the ring first, then add one support. Go across the frame and secure a support 180 degrees opposite. Work your way around the trampoline until it is freestanding. Attach the trampoline surface – Attach each of the springs two at a time, following the same procedure as you attached the support legs. Attach two springs, then go 180 degrees to the opposite side of the tarp and attach two more. Continue this job until all the springs are attached. Secure the safety pad – Next, follow the same process as above, and use the bungee straps to secure the safety pad around the outside of the jumping area. Add the safety enclosure – Go around and insert each of the enclosure supports into the preset holes in the support legs. Once each support is secure, drape the net over the supports and tie it securely. Check the entrance zipper. Safety walk around – Circle your assembled trampoline, checking for potential hazards you may have missed. At each support connection point, try to shake the stability. Once you’re sure your trampoline is safe and secure, let the jumping fun begin! Owners of an ExacMe 6W Legs Trampoline are consistently impressed by how sturdy this trampoline is. The idea that it is made with galvanized steel tubing as opposed to welded sections is the reason this trampoline feels sturdier than comparable models. Having a netted enclosure to improve safety is also a frequently mentioned advantage. The net itself is important, but parents also enjoy that they are able to watch their kids play. Some enclosures don’t allow the same level of visibility as the ExacMe 6W Legs Trampoline. There were a few reviews who thought the price was a little high for this trampoline, but the number of owners who were not impressed by the quality was zero. A few owners also said that the estimated assembly time was grossly understated. ExacMe 6W Legs Trampoline will give your kids and their friends years of fun and enjoyment. It’s also a super way to get kids active. If you’ve owned or your kids have used the ExacMe 6W Legs Trampoline, tell us about your experience. In addition, if you think there are any points we missed in this review; let us hear about those as well.